Manufactured from premium-quality solid northern red oak with a golden oak finish, the Maestro Easel from American Easel will impress you with its beauty. Standing 70" (178 cm) high at its compact height and 96” (244 cm) high when fully extended, the Maestro holds canvases up to 84" (213 cm) high, and features an adjustable 12" (30 cm) top canvas holder, and an adjustable 24" (61 cm) large bottom tray with a stainless steel thinner/brush canister and easy-clean white surface. Adjustments are simple with easy-turn knobs. 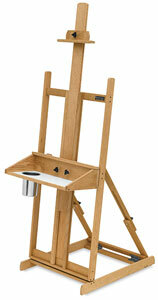 The easel measures 30" × 24" (76 cm × 61 cm) at the base and features four non-skid rubber feet. Some assembly is required. Weighs 30 lb (13.6 kg).